Interesting book launch event at the Open Society Institute's New York office next Tues, 23rd September. Here. I'm hoping to be there. This month, the Revenue Watch Institute and the Open Society Institute Documentary Photography Project present a discussion of oil in the Niger Delta and the use of photography in advocating for social change. 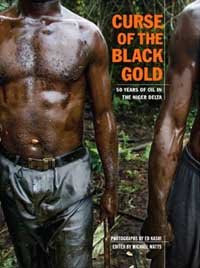 Photographer Ed Kashi and author and professor Michael Watts will also be signing copies of their new book, Curse of the Black Gold: 50 Years of Oil in the Niger Delta. Many photo shoots, radio programmes, tv documentaries shot by foreign reporters have made it out of the Niger Delta, chronicling human rights abuses, environmental mismanagement, corrupt officials and nothing has changed. The authorities are quite insensitive to such reports, in typical keeping with their callous and greedy nature. Corruption, neglect, mismanagement and indifference are part of the Nigerian political landscape, apart from more needlessly lost lives, and destruction not an awful lot will change in the short-term. This is not to say that the locals are innocent victims in all of this, the vast majority of their representatives are insincere and corrupt. As an aside, Nigeria has signed some memorandum of understanding with Gazprom. It has now been rumoured that the European Union (EU) are looking to diversify their source of energy away from Russia, so as to avoid over-dependence on Russia. One of the options the EU are entertaining is to source some of their energy (in the form form of liquified natural gas) by pipe from Nigeria to across the Sahara. If Gazprom were to get the contract to build the pipeline, should such a thing go ahead. Would this not be a conflict of interest for the Russians, as they want to keep the EU dangling by their "short and curlies"? In other words it is not in their interest to see the pipeline go ahead and work. If they do build it, it would probably be defective in many respects and rest assured, the Europeans won't want a dodgey supplier ie Nigeria. Would it not be better for Nigeria to remove itself from the grand game of chess occurring between the EU and Russia and get someone else with a good reputation for building pipelines, who is not compromised ie Turkey? Sorry, this was the link I was after in my previous post. If pictures and words could save a country, the Niger delta would have been saved long ago.